Earlier in the summer I posted that we were looking at the possibility of a completely new administration in our building this school year. Last night, our new principal, who was a former assistant principal, had a faculty meeting. I made a comment earlier in the spring, IF there was anyone in our building that I would trust to bring us together and move us forward, it was him. I am very confident in him to be the leader we need. He shared a couple of new things he envisioned for the school year – but then shared his philosophy of education and expectations he had for us. Just a few highlights I jotted down. All reasonable and I believed him when he said he would hold us to these expectations. Extra curriculuar activitites are the heart and soul of our school. If we can get kids to participate in something – clubs, sports, band – they feel a since of belonging…like they are part of a community – they will take pride in all they are doing because its part of “their school”. I am excited he has plans for a Showcase of Learning this fall – highlighting the great things students are doing in our classrooms! I was clearing out some files this weekend and ran across this packet from a presentation at KCTM in 2002. I had just completed my initial National Board Certification earlier that spring (still didn’t know if I had certified yet) and thought these lessons were worth sharing. I’m not sure if you’ll be able to read the first two pages – orginal files are long gone and just by happenstance I rance across this packet. Reading through it – its almost like I was “blogging” 10 years ago – but it reminds how important reflection on your lesson will always be – how much you can learn about teaching by pausing to think about student thinking/responses. Whether you use actual geo-boards, paper/pencil or modify to www.geogebra.org – maybe they will give you some ideas for your classroom. *I used the reinforcement tabs for students to write coordinates/label points on geo-boards. BUT don’t let them peel and stick…just leave on paper and drop over the geo-board tab. Its been one of those busy weeks, so I’ve not actually created anything “new” but decided to share something I used last spring. The idea developed after @lmhenry9 tweeted a need for ideas to use with polynomial stations. A month or so later – I decided to use a similar idea. I purchased a bag of 8 wooden blocks from Hobby Lobby ~ $3. Used my sharpie to add expressions to the blocks. Created instruction cards for each station. Based on a pre-assessment, I grouped kids by similar struggles – those who were a step ahead could “play” more game-like activites – while I could spend time with groups who needed some extra support. We spent a couple of days in class rotating activities. I think most pictures are self explanatory. 2. Adding / Subtracting Polynomials* – let students know which “color” block is the first polynomial. For a little discussion, ask if it really matters? If so, when/why? 5. Factor Match – I didn’t have orginal copies with me to scan – but will get them posted here asap. I also had a station utilzing a Tarsia-style puzzle with variety of polynomial multiplication expressions. Tic Tac Times – Students pick 2 factos listed at bottom of the page and multiply. Place game piece on the product. First player to get 3 or 4 (you pick the rules) in a row, wins! For more challenge, each player must use one of the factors just used by their opponent. * A sidebar – while creating my blocks – my daughter asked what I was doing. I replied – making a game for my students to play. She asked – can I play it to? My first instinct was to tell her No – but I bit my tongue. And then I remembered a problem she had left on my board one day afterschool and my students had asked me what it was… (After school, she and a couple of other “teachers’ kids” hang out in my room and play school.) 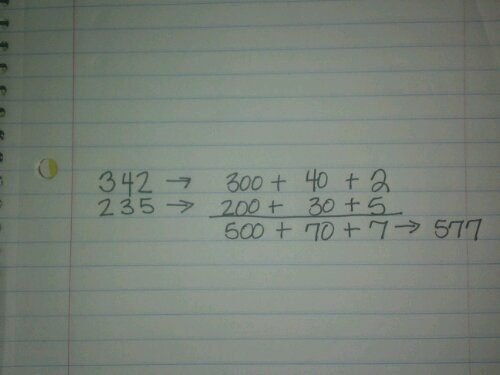 I realized it was very similar to how she had been adding and subtracting 3 digit numbers in class this year. So I explained how the x^2 was like her 100’s, x was like the 10’s and the # was just one’s. She rolled the blocks and did a few problems…I’m thinking – if a 2nd grader can do it – so can 9th graders, right? #myfavfriday Who Is Robert Wadlow & Super Size It! “My Favorite” was probably my favorite part of #TMC12, literally. The snippets were quick ideas you could easily tweak for your own classroom. So when @misscalcul8 suggested we continue – I was excited. That is until I started thinking about what I would share. How do I pick my favorite? My favorite what? I have a whole list of things I want to share – but today…a favorite unit I’ve used many, many times successfully with my students. Anyway, to end the day we all measure our foot lengths and heights and create a scatterplot…surprised to see – its somewhat correlated (yes 9th graders are growing, so its not perfectly linear…) – then we add RW’s (ft, ht) to the plot…again, surprised to see, he fits the pattern…just a bigger version. We calculate the height/foot length ratios for the class, then split the data out to boys and girls to see if there is indeed a common ratio…once again, surprised to see how close the ratios actually are. We talk about people who are clumsy in while growing – what their ratios would look like – if they are too tall for their feet, etc. I shoudl note I used this as opportunity to teach students how to enter data into lists on TI-84, L1=foot length, L2=height, L3 = (L2/L1) and how to create scatterplots on graphing calculator. One year I even had students ask if this was related to Vertruvian Man and explore if they were similar to him. As a final project in this unit, I would assign Super Size It as part of their unit assessment. Y, B, H with their Super Size It projects. 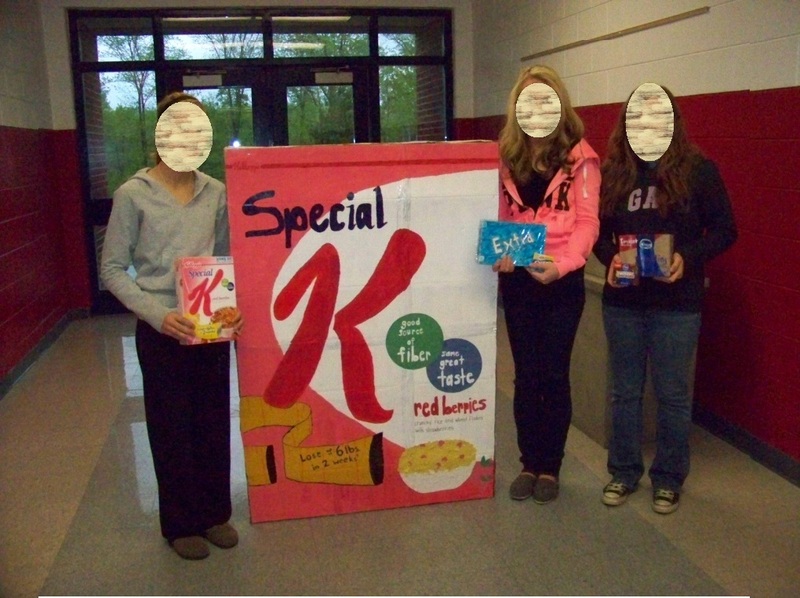 Special K – scale factor of 5 …125 times more cereal! Extra Gum – scale factor of 3 … 27 times more gum! Chocolate Pudding – scale factor of 2 …8 times more pudding! You could easily modify this activity to fit high school geometry – to determine how scale factors affect surface area / volume ratios. So, for My Favorite Friday – one of my favorite units – I no longer get to use – hopefully one of you can use an idea or two and keep the spirit of Robert Wadlow & Super Size It alive! Has it seriously been a week since I was here? Yep. Just one quick thought on #TMC12 for today… It was everything I expected and it was nothing like I expected. Yes – these people are the rockstars they seem to be on twitter… they are genuine in their desire to become better teachers – willing to share – wanting to learn… and give their students the best learning opportunities possible! But what I was most amazed with – I was there with people I had never met – I guess I was expecting it to be weird meeting everyone for the first time -but everyone was exactly as I expected them to be… oddly as it may be – I felt like I had known them for ages. I walked in to MICDS in awe of the company – I left MICDS knowing I had lifelong friendships / colleagues from all across the country. These folks are the.real.deal. To end Saturday, we broke out into content areas. I was part of the Algebra I group. There were some great ideas shared – @cheesemonkeysf rational expressions scavenger hunt game; I’m sorry I didn’t write the name down, was it @msimmons5 (sorry if not) – had this great SURVIVOR review game he uses – within a matter of minutes – there were suggestions shared on what to do with kicked-off / disbanded teams. Hoping he will actually start a blog and well, blog about the idea in its entirety (sp?). Each student will complete his/her own work. When everyone has completed 1 problem – they compare answers – to determine which is correct and will be used for the group answer. if correct, hole punch the outer edge of the problem, students return to work space and continue to next problem. if incorrect, they return to workspace and rework. She also suggested staggering which # each team begins working on. Students must talk / agree on a solution. Students are physically up and moving. Sure you could put a check mark, stamp it, etc. but the sound / click of the hole – punch (or stapler) does something crazy and the students – especially for those who are struggling are motivated to keep on working. Weird, huh? So for #made4math I am sharing a radical equation hole-punch game. It could be used as a review or simply as in-class skills practice. Yep. That’s my starting point today! Growing up I collected pencils – I wish I had taken the time to run by my mom & dad’s and dig out my BOX of pencils. I had chocolate flavored ones, shaped like hearts the length of the barrel. From many places – field trips, vacations, stores, events…they were cheap and small…perfect souvenirs (sp?). On twitter last week was a discussion of how to identify your pencils – so students would return when they borrowed them. One person suggested duct tape – great idea! But I recalled seeing a friend at church with an ink pen and a bright yellow Flower attached to the top. It looked like so much fun when she was writing! I did a search to find some ideas – also ran across this post about artsy pencils and plumed pencils. Check it out! I know. Some of you are against letting kids borrow supplies. I’ve been there and done that. I could send them to the locker, send them to office after 3-strikes, you’re out, but the truth is – my time is limited and I need them in my room as much as possible. 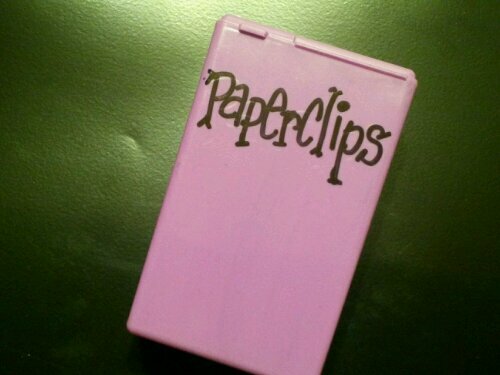 Don’t tell me you’ve never shown up in a meeting without something to write with… Besides, have you actually tried to figure out why they show up without a pencil? 3. They don’t bring a pencil because they want to get out of work (When they borrow yours, they can now work – no excuses). Yes, I agree – if it becomes a habit, you may have an issue. But take the time and talk with them – get to the root of the problem first. In the meantime, enjoy the beauty of your new pencils! 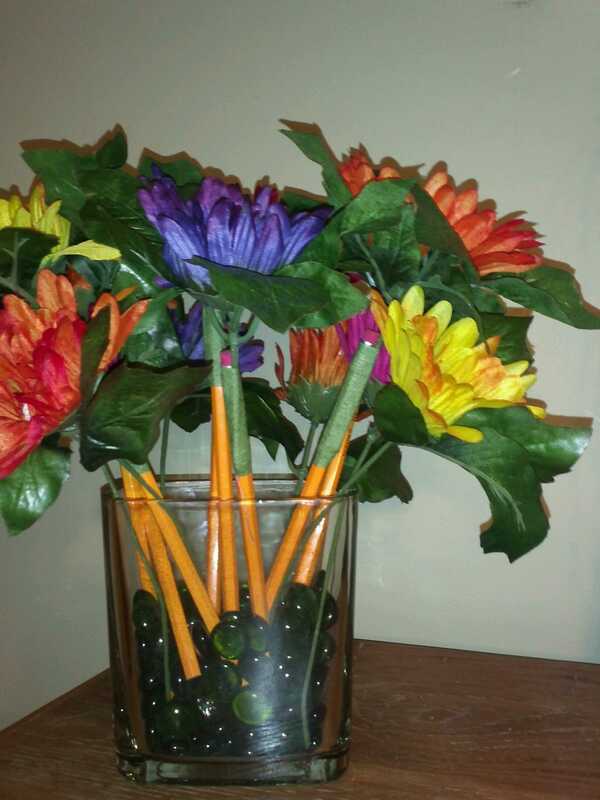 Half-price bunch of flowers, package of floral tape, pencils. 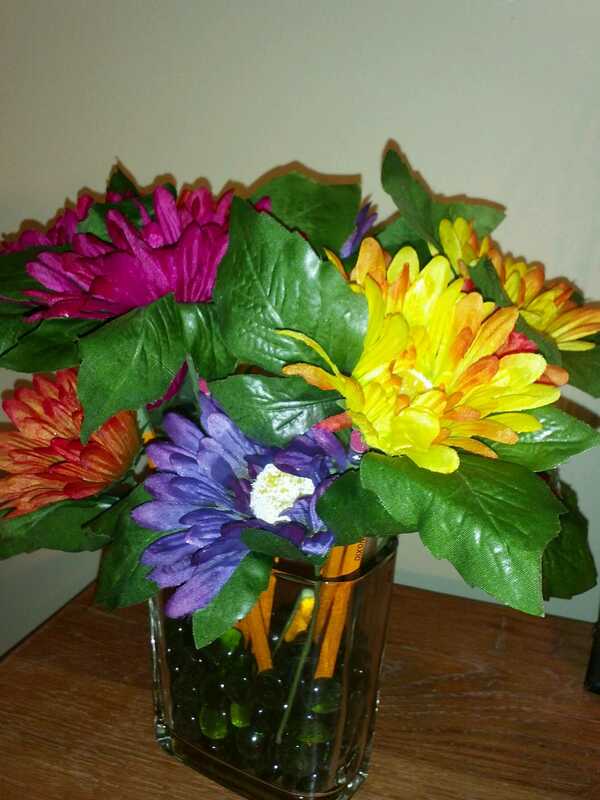 I simply used a wire cutter to make the stems 2-3 inches long. Wrap floral tape tightly around it. 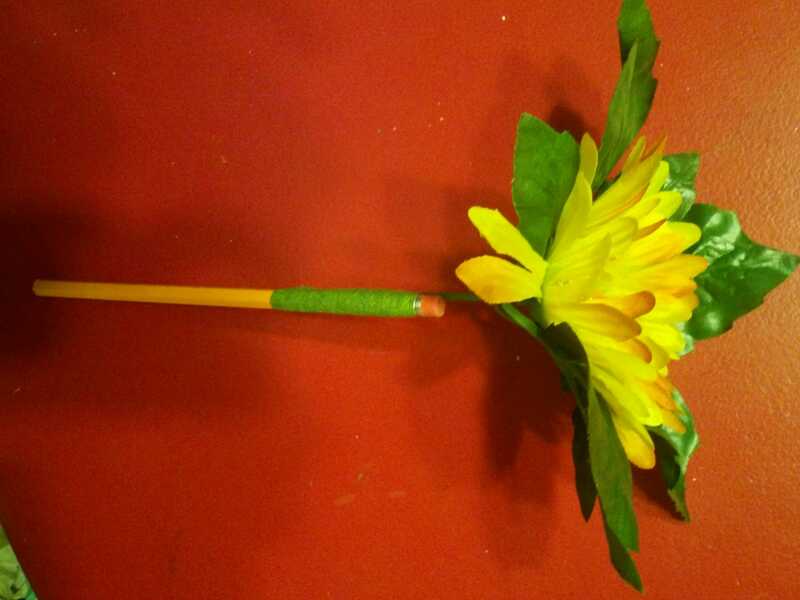 When pencils become too short – remove flower and attach to another pencil. I also purchased a pack of feathers and my 8yo really got into this (her and the cat!) 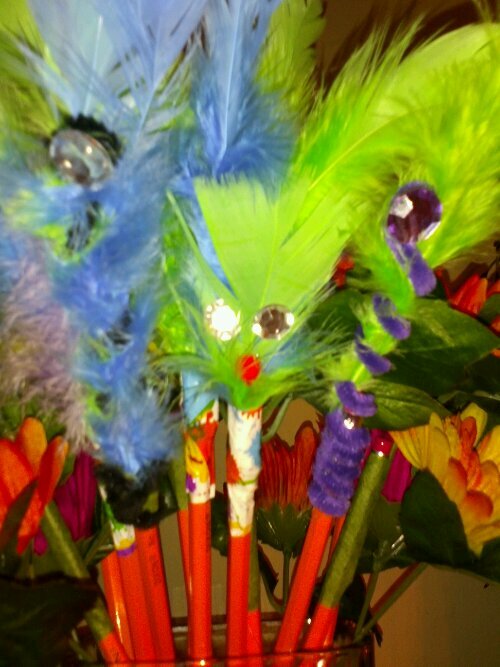 You can see she hot glued some bling & buttons, a few pipe cleaners too…just plain old fun! Yes, someone wants to know how to you erase – my 8yo asked the same question. I have several of the “FOR BIG MISTAKES” pink erasers on hand if needed. 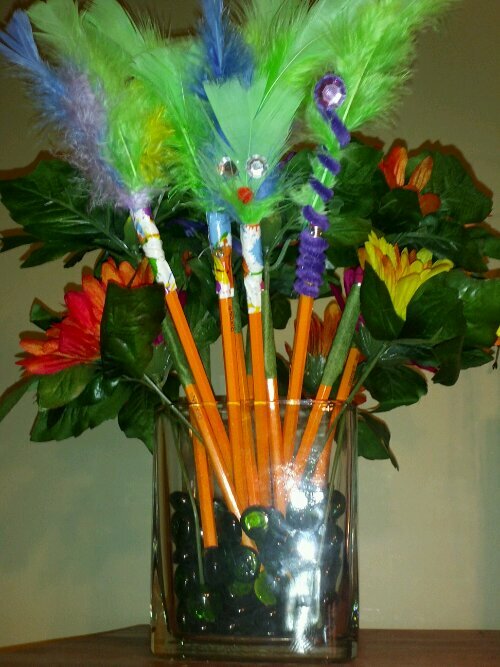 A heavy vase and a few marbles to hold my “pencil flowers” and I have an adorable arrangement for my desk. I was leary of the marbles in the vase, that they would break the pencil tips – but just the opposite, it allows the tips to fall between the marbles. I am actually considering (on one of those off – schedule days) – letting students craft up some pencils, storing them in a bucket in the cabinet and getting them out as needed. This way students will always know they belong to Room 148 and can police pencil thieves for me! As I have been looking for better literacy strategies this summer, I ran across several mentions of C-Notes or Cornell Notes. @druinok has a nice post here. I was sharing the strategy with a science – who had used them in an English class before and had found them to be very successful, but mentioned you must be purposeful in requiring students to revisit, fill in left column and complete the summary, otherwise, its not useful. After a couple of days, she messaged me and had read about having students create questions from their notes. I really. really. like this idea. We discussed in the beginning to allow them to pull out the big idea, then next step create 3 questions. Eventually, students would only be allowed to create one basic DOK1 question and the other 2 would require more in depth thinking to answer. What an awesome idea! I love having a colleague like this to bounce ideas back and forth! Another idea someone mentioned – not sure if twitter or a comment in a post – but to only allow students a tweet for their summary – limiting the number of characters…really requires kids to develop a concise summary. I really liked @druinok’s file for the bookmark – but I’ll be honest, I’m just feeling too lazy to cut out that many. I’m not sure that my idea will work = it may have made my left column too wide(2 inches) – but I’m going to use it for now. I purchased some packages of straight-edged border $ per pack. 39 inches / 4 = 9.75 inches – just long enough to 3-hole punch. 12 pieces x 4 strips each = 48 bookmarks! My intention is to print off labels with my contact info and/or QR Code for class website for students to place on the bookmarks. This project for all of my students cost me $3 plus labels, if you have to buy them. It took under 10 minutes to cut and hole-punch 48 bookmarks. $1 frame from Mighty Dollar and a print off of @druinok ‘s file! I think Ican update this end of day Friday before I leave school, transferring Next Week to the to be done side… giving me some focus for the upcoming week! Love this idea! Hoping it will cut down on amount of post-its I have plastered all over my desk. Its been another great week. 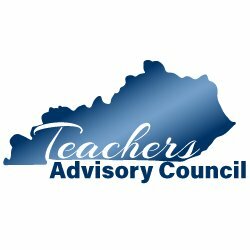 Just over 3 weeks and my kiddos will be back in the classroom – so I will likely be getting some lessons/activities finalized after getting back from TMC12. I’ve been putting several things off because of some of the great sessions planned! 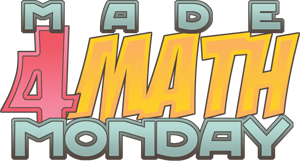 Looking forward to all the Made4Math Monday Projects today! Each year I ask students to fill out evaluations on me – explaining I need their feedback so I can grow as a teacher. I tell them administrators can come into my classroom and give me an evaluation – but they are with me EVERY SINGLE DAY – they are the ones who know what’s going on and I respect their views / opinions. I usually wait a couple of weeks after the end of the semester to read through them – but its been over 8 weeks. Today, I sat down and began reading. I chose to separate my evaluations – into 2 groups. 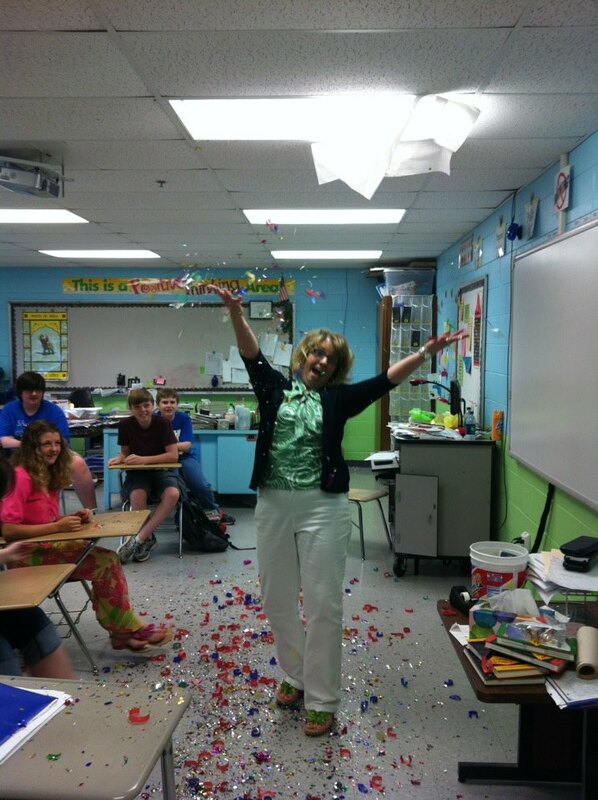 This first group was for students who have basicallly met / surpassed benchmark tests in previous grade. The second group, Part 2, will include students who have some gaps in their learning, are not as intrinsically motivated and may require more support in getting to mastery. A couple of things really stood out to me. 3 math topics you have mastered this school year. Top 3 topics (tying) : Linear Functions, Polynomials/Factoring, Quadratics – followed closely by Function Families, Solving Equations/Inequalities and then a dip in responses to Exponents and Systems. Very Few students listed Radicals and Sequences. As I look through the entire evaluations – I realize the 3 top units, I successfully incorporated hands-on activities and allowed their learning experiences to be “more open” meaning – I was not so rigid with assignments – actually I gave them assignments & answer keys ahead of time and they chose to work on what they needed to. (Remind you, these classes were more self-miotivated learners, so this option was successful). Hands-on learning, games, lab activities – students were up out of their seats and actively engaged. I have already begun a post about activities/strategies I used in these units and will start to share those soon. The Radicals is no surprise since its the top of my next list. Sequences I was disappointed – we separated them into a self-contained unit – but I’m wondering if they should be placed back into the corresponding unit after seeing some of these reponses. 3 math concepts you still have questions about. Radicals was listed 34% of the time! Wow. That’s huge. (Makes me feel like failure. 😦 ) Systems – specifically elimination was listed 11% of the time ( surprise to me) and Exponentials 8% (this one was a surprise also since these students performed so well on their unit assessments). There were 14 other random topics listed – meaning only 1 or 2 students listed each one. These surveys are really no surprise – their EOC confirms their concerns, strengths and weakenesses. When I analyzed unit assessments, I often looked at problems that >25% of students had trouble with – to me there may be issues with how I presented the content, thus I revisit the topic/concept. Radicals is a topic I’ve been looking for resources this summer – knowing I had to improve with this topic! When we met as a department, we are looking at the first unit Real Numbers – embedding an intro to radicals within the unit – since Rational vs. Irrational was one of the standards we addressed. I have located a few online resources – like Real Teaching means Real Learning’s post on Teaching Radicals in Less than Five MInutes. I plan to tweak the “game” a bit – but it uses the basis of Go Fish! Students play rounds of Go Fish! collecting “books of 2”, next round “books of 3”, 4 and so on…. but with Books of 5 – cannot be done since they only have up to 4 of a kind in their decks. This leads to examples of square roots, cube roots, 4th root and so on with an expression involving both numbers and variables. My colleague and I pulled out a deck of cards and tested the game – going through the lesson framing, etc. We think it will be a success! I am looking at the use of pythagorean theorem / perimeter of triangles to intro operations with radicals. I welcome any resources you have found to help students with these topics. What are things I do well as a teacher? Most of the responses fell within each of these listed. I would be very satisfied if my child was in a classroom where the teacher did these things well. * I will have to share more on these in a later post! Students presented me with this poster as a reminder of “all they actually learned in math class. At the end of the year awards ceremony, I was awarded “The Best Jim Carey Voice Impersonation.” I’m not quite sure if there is a compliment or a dig in there! All I can say is – I LOVE MY JOB! And I get exctied! Oddly enough, the student who came up with this award is the same one who responded I was moody on things I needed to improve. What are things I could improve as a teacher? There were other responses like “you do everything well” etc – which makes me feel that I was a success overall as a teacher in general – but truth is, I know there are many areas for growth! The day I quit asking how can I improve, is the day I need to stop working with students…and get out of the classroom! What activities, strategies, methods did you find most beneficial / effective? Rating of online resources we used throughout the school year. I was in the computer lab one day each week and used this time as RTI – if students were progressing, they were given a specific task to complete online, then were asked to learn all they could about upcoming topics – I tried to use it as a front-loading strategy. Letting them expose themselves to online resources on topics in the next unit. I then asked them to journal about their finds – but this year, I think I will play off of I Speak Math’s idea of utilizing a class wikispace and allow students to fill Concept Help Pages with online resources they find helpful. I gave students a list of most online resources students had used this year, but I am only listing the ones they rated a VERY helpful (9 or 10 out of 10). Ten Marks as a teacher you are able to set up your classes (free), choose a basic curriclum, assign entire units or specific topics to the entire class or individual students. It was a good resources for students on home-bound placement or those who had been out for extended days. I also used it as a resource to share with parents for students who needed remedial work for mastery of standards. Like any resource, its not and end-all, be-all – but I found it to meet some of my classroom needs. 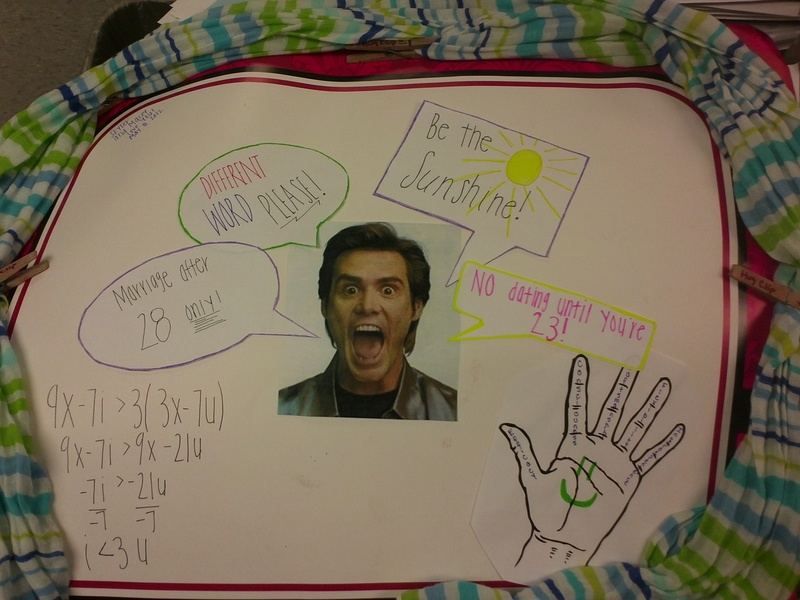 Khan Academy from a handful of students. – I realize there are debates about Khan – I agree with some arguments – but for certain situations / students it is a great resource. I had a student who loved math and completed many, many lessons/practice to fill in “downtime” during the lab and on own time at home – just because they wanted to learn more, beyond what I was doing…I see nothing wrong with that. I often made assignments with Geogebra using investigations and skill/concepts in Ten Marks – so these were probably the 2 they were exposed to most often. By far the Cool Math was listed as most helpful – students would often go there first as they began to look for help. Students like the simplistic explanation – they say its easy to follow and they like the crunchers – practice options with some lessons. …but the one that made me most proud as a teacher… a student responded “Learning!” And that, folks, is what its all about. I cannot read all of the #made4math posts without actually doing some of them! I have been overwhelmed at the amazing projects and tips teachers have been sharing! 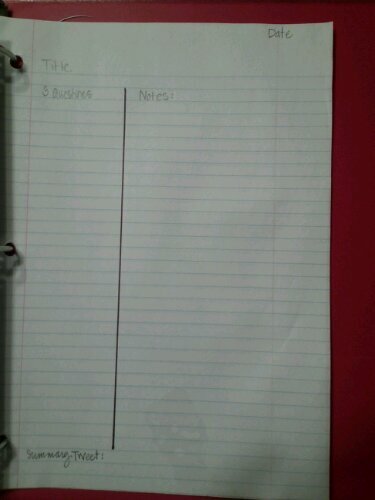 I am planning a run to the store to pick up a couple of items needed for my to-do list. I will share those as I complete them. Yesterday I visited @roitzc Math in the Middle and @lysareiger MathReiger to learn more about the Tarsia Math Puzzles from Hermitech Labs. Its free. Enough said. Seriously, though – I gave it a run yesterday, creating a puzzle for Solving Quadratic Equations using Square Roots. You will need the software installed before downloading the files. I have not figured out how to translate to PDF yet (feel free to give me tips!). You are given a table to double check your entries for mistakes before printing puzzle. You have options to print different size puzzle pieces. You can choose to print a simplified version – with center pieces of solution attached as starting spot for differentiation purposes. Variety of puzzle types to choose from. Enter title / concept to be printed on back of puzzle pieces. My first print I was disappointed because my front/back did not match up. However, I found that if I print the output side first and place those copies in my printer, face up, with top of screen shot from computer for backside is the same as side entering printer first, it lines up perfectly! This really has nothing to do with the math classroom, but the discussion on twitter the other night was about coming to TMC12 dressed as your avatar – uh. Well. My avatar was a picture of me. Boring. So I ventured out to find a free avatar creator. Not sure which ones are best but I used DoppelMe to create a version of myself. They had super-hero costumes – and though I know being a math teacher does require some super-powers, I just didn’t feel worthy to wear the Wonder Woman crown and boots! I’ll leave that for some of my tweeps at TMC12!!! Okay, so my hair is not that blond and definitely not that cute cut. But green is my favorite color! I only wish they had some scarves in their accessory line. 😦 I am the scarf-queen at RCHS… no one can compete with my scarf collection! Seriously. People see scarves – they think of me – they buy me one! I am overwhelmed by their generosity! Next I stopped by @_CindyWallace_ Sch00l Stuff to learn more about creating a podcast. I know folks have been doing these for ages – and its something I’ve been interested in for the past year – but I’ve never taken the time to experiment and learn. So here we go! Well, that’ll have to wait. I get my account set up – ready to record and realize…the only mic I have is at school. More on that later! I have to share a project because I know a few of you are sewers… This is from Make-It Love-It. She has great tutorials. And this fabric fishy-bag makes an adorable gift for little girls! So what’s up for M4MM this week? Maybe not so crafty – but useful and needed. Often I am collecting “vertical” height data – either with students’ heights, bouncy balls or Barbie Bungee. 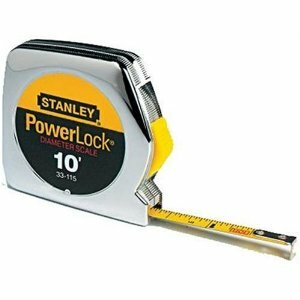 I have a set of 10 metal tape measures (from the tech prep era grants), similar to this but it takes several pieces of duct tape criss-crossed to hold these up on a wall. It would be more ideal if I could find lightweight, vinyl sewing tape measures. However, most of those are only 60″. Considering I teach 9th grade, many of my students are taller than this. I picked up a couple of the tapes at my local Mighty $1 planning to piece them together and use a sharpie to remark it and make a longer tape. 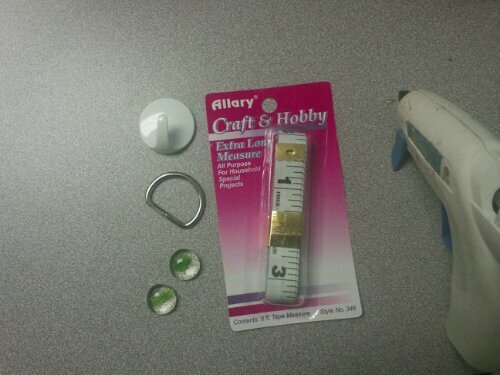 To my surprise – the tape measures were 8′! Woo hoo! So, now, I actually needed to cut the tape measure down. A couple of marbles/stones for weight. I trimmed my tape to 82″, folded it over the D-ring and glued it. I then glued a couple of flat marbles to the bottom to give it weight, allowing it to hang straighter on the wall. Next, I measured 80″ on my wall to determine where to place my hook. With the hooks in-place around my classroom, I can pull the tape measures out of the box and quickly hang them up prior to data collection. They can also be hung backwards to measure in centimeters. This is a project I’ve contemplated for a couple of years – and MMM has given me reason to actually do it! If you also notice my white board border (Hmmm. How are those two words related? Random thought from all the literacy reading I’ve been doing this summer.) This is something I’ve done for several years. I purchase magnetic strips; cut them down to 1″ – 2″ pieces; hot glue them on the backs of border strips and use them on my white-boards. I make sure to have pieces on the ends of the border strips and space out a few magnets in between. 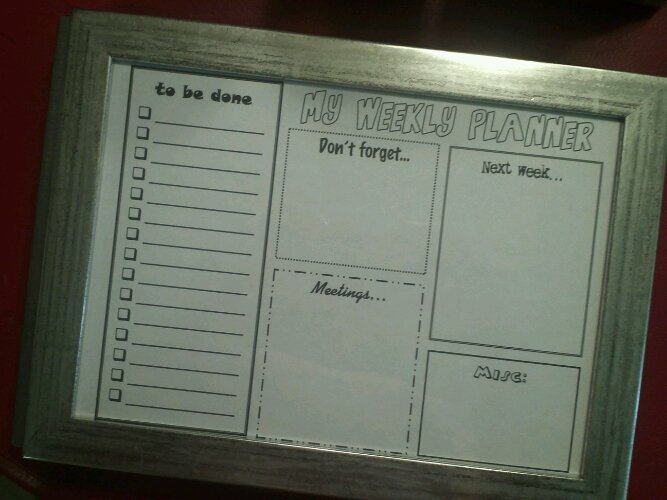 I actually saw this same idea on an elementary blog the other day (sorry, I didn’t pin it) – but she had laminated her border, then hot glued the magnets on it. I’m just too lazy to do this – but I’m sure it would allow the border to last longer. Although, mine lasted several years and still looked great without being laminated- I was just ready for a change – and I did occasionally have to replace a strip that had gotten bent/written on. You could easily use different borders to block your larger boards off into sections. Another project I am working on – organizing materials needed for Station Activities from this book . Though not difficult, it takes a bit of time to prepare the cards needed for some of the activities. I began with their suggestion of index cards – then decided to actually create a file of the cards, so I could share with other teachers. Feel free to borrow/tweak and use in your classroom – and share – please, just don’t sell “my cards.” I will share the files here as I complete them. Open the files, print on card stock ( I suggest a different color for each station to keep them separated, but they are labeled*), cut apart, laminate (if you like) and have fun! I also purchased 8×10 clear acrylic frames as suggested by I Speak Math in this post. I really like her idea of creating a 5th station but only assigning students to 4 stations – to avoid overlap – removing the set time limit at each station can allow groups to work at their own pace. As I plan for my 5th stations, I will post those suggestions here. If you notice a missing card set, either the lesson does not require cards or I just haven’t finished them/uploaded yet (sorry). *Card Label sample: REI Set 1 Solving Linear Equations #2 means Reasoning with Equations and Inequalities Activity Set 1 and Station #2. The labels may/may not need to be there since this is my first go-round with this book/activities. While making these cards and going through some of the activities – my wheels have started turning – on ways I can use some of the strategies in other pieces of content standards as well…more to come on those later! Hope you’ve found a helpful hint or resource in my post today!!! What an exciting day! I cannot wait to see what everyone “brings” to share at our party! I have a classroom set of dry-erase boards – that have been used A LOT through the years. They are scratched and the finish does not allow the ink to erase smoothly or completely. 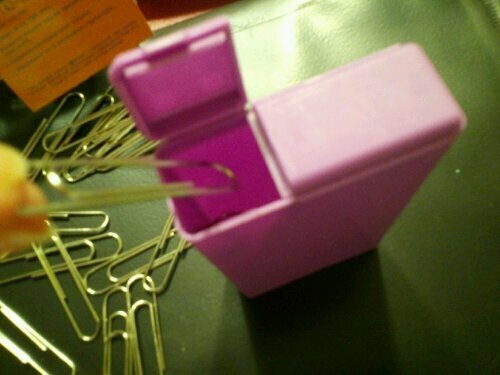 So, when I saw this first idea, tagged on Pinterest from wikihow.com, I wondered Would it really work? I cleaned the board – both sides – then sprayed on a bit of WD-40 and used my paper towels to wipe it on and “dry” it off. I chose to let it set for a while and wiped it completely again. The board is shiny and smoothy to the touch and when I swiped it – the ink erased with ease, no scrubbing. If you use too much or do not wipe it off well, it will be greasy to the touch. There is a oily odor, but with time (aka this morning) its faded. I am 20 miles from the nearest Wal-mart, 35 miles from Hobby Lobby – but we have a little store in town called Mighty Dollar. 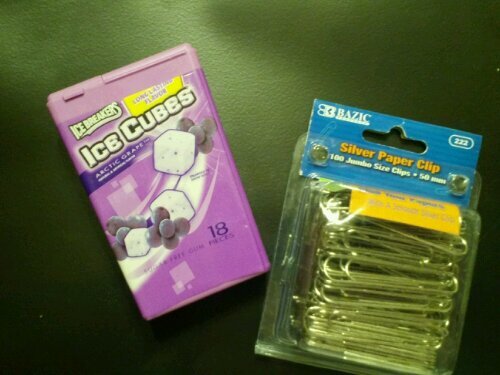 A quick trip to pick up some popsicle sticks (for my original Made4Math plan) – they were out, so I found the pom-poms ($1) a set of 6 dry erase markers ($1 per pack) and back home to do some hot-glueing (sp?)! I was super excited when I saw this idea the other day. I couldn’t find a definitive source – Pinterest via Math Teacher, @druinok, Julie Reulbach, Sarah Hagan – so thank you to whomever shared this GENIUS idea! The pompoms really do work! I chose to place them on the top of the cap, so the cap can be placed on pen as students write. This may or may not work for certain types of pens – depending how the cap snaps on when open. I applied pressure of 10 seconds. After allowing them to set for a while – I pulled on the pom poms and none of them came off – though I’m sure, like anything, with enough pressure, they will peel off. Simple, inexpensive and it works well! Two thumbs up!! My last tip – is something I did years ago – before I had “the real” dry erase boards. Create your own by purchasing a pack of SMOOTH page protectors. Around $4 for package of 25. Unless you have a Mighty Dollar – $1 for pack of 20! Run 2-sided copies of grid paper and coordinate plane on heavy cardstock, slip it in! Voila! Instant dry erase boards! I didn’t have my set at home – so I just placed a sheet of regular graph paper for an example. 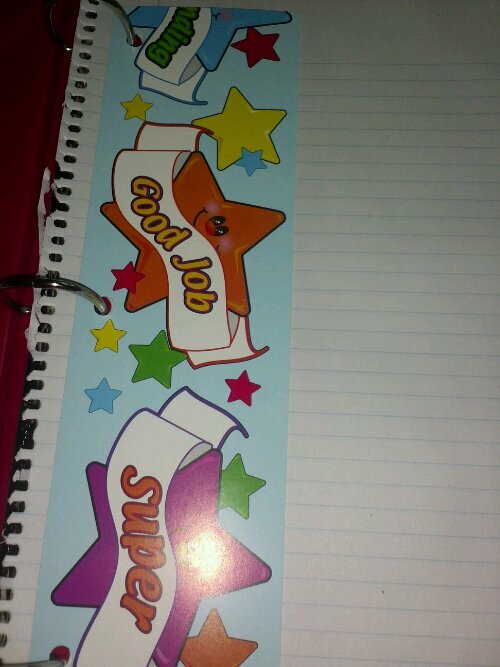 This year, I believe I will have every student to keep one of these page protectors in their binders – this will allow for fewer copies on in-class assignments / practice problems. If I provide them with copies of graph/grid paper I will use often – then everyone will have their own “handy-dandy” dry erase boards at their disposal! I hope my #Made4Math ideas will inspire your classroom!